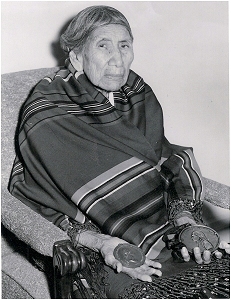 In May 1882, an Osage-Quapaw girl was born on Quapaw Creek west of what is now Skiatook, OK. Her mother was Wa-Si-stah who named her Mi-koi-she (far away sun) but she was baptized Mary Maude Angel by the Catholic Sisters of St. Mary’s Mission. Her mother was full blood Osage, Claremore Band. Louis Angel, her father, known as Tall Chief or Kah-Hi-Kah-Steh-Tah was the last hereditary chief of the Quapaw Tribe. She was asked to be the Chief by the Tribe when he died in 1918, but she said she wasn’t ready and asked John Quapaw to serve as Chief. Quapaw babies, soon after their birth, were brought to Tall Chief to have their Indian names bestowed upon them . He taught and passed this right to his daughter, Mary Maude. She decided not to pass the right on to her descendants and after her death there would be no more Quapaw Indian names given (see Quapaw Name Giving Oral History) . She said the reason was that there was no full blood Quapaws left. Grandma was held in high regard by her many friends and members of the tribe. The older people of the Tribe looked upon her as the leader of their people. They often consulted with her on ceremonials, burials, history, and kinships. In her younger days, Grandma attended government boarding school in Pawhuska during the winter months, and most of her summers were spent doing the things boys did-hunting (she would hunt birds with a bow and arrow) swimming, foot racing and traveling with her father. She said she beat all the girls in races and most of the boys at the Pawhuska boarding school. She won many archery contests in her later years. She and her father would often have to break the ice in order to go swimming in the winter. They also broke the ice to catch the otters in the ponds. Her pets consisted mostly of the wild animals and she was particularly fond of her pet deer. She was married at 16 years old to William Thompson, full blood Quapaw and had one son and two daughters. After his death in May 1904, she married William James Supernaw, Sr., Munci Indian on January 2, 1907. They had their 50th wedding anniversary in 1957. There were four boys and a daughter born of this union. She was a member of the Rebekahs, 40 et 8, American Legion Auxiliary, founding member of Tulsa Pow Wow Club, charter member of Kah-hi-kah-steh Club, member of Wah-sha-she Club. She passed away in October of 1972 and will be remembered as a historical legend.